Note: Since I’m away teaching at the DFW Fiber Fest this week, these posts may show up earlier than the posts they reference–check back, I’ll add direct links as soon as I can. I’ve known Diane Gilleland, aka Sister Diane of CraftyPod, for so long that I can’t quite remember how we ever found each other in this vast world of the internets. I have the suspicion it had something to do with her producing a podcast and me being the Craft Editor for Adorn. The link to the audio for that podcast is broken, and part of me is okay with it. It seems like such a long time ago! I remember how giddy and excited I was to talk to Diane, who was and is as enthusiastic about crafts as I am. 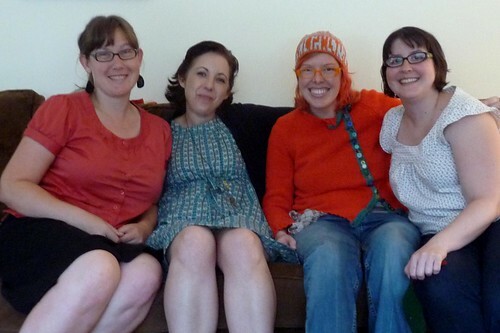 Here are Susan, Diane, Lee and me in Portland–I went there in ‘09 to sign copies of Crochet Adorned. Since that podcast, both of us have worked together in different ways over the years, on blogs, e-books, etc. She also contributed some lovely Vintage Kitchen Trivets to my first book. Diane is the author her own photo tutorial intensive book, Kanzashi in Bloom , which is a really accessible craft for anyone, even if you are not a master sewer. She also writes a lot of great posts about the online craft community, social media, trying to make it in the crafty biz world, and, well, plastic canvas. She has a bit of a thing for vintage crafts. I always love to read what Diane has to say as her posts are always well thought out and meaningfull. Head on over to see what she has in store for you today. I loved your profile in the new Crochet Today magazine. I love your colours and patterns.